Monkey loves the story of Van Gogh cutting his ear off and is excited to see his paintings. And so started the first post of summer on this blog last year. Last summer I did my best to create special memories with the kids while navigating my way through divorce negotiations. Was it the best summer we ever shared together? Probably not. But whenever there was respite from feeling emotionally drained and sad, we laughed and enjoyed the summer. Last week, however, when we created our summer activities wish list, I was as excited as the kids. This summer I will not be hemorrhaging money to a lawyer and mediator or feeling sad continuously. My divorce is final. Create a family reading club. Host massive water balloon fight with friends. See a baseball game in two stadiums we have not visited yet. Try eating a tomato and two other foods I have not tried (Monkey). 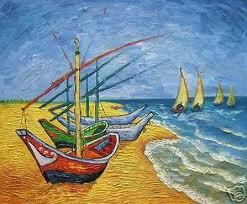 See a Van Gogh painting. Try five new (to us) restaurants. While this isn’t going to be an emotionally and financially draining summer, I do worry about all I have going on this summer. I am in photography school, write for another site twice a week, work for a social media site, and am working on two new blog projects that will launch in the fall. I know I am over-extended this summer, but it is a good feeling. These things are an exciting part of my future; it isn’t the depressing work of dismantling a marriage. Until then I will enjoy my crazy, hectic summer days. I will embrace how much better life is one year later, knowing I am on the right path for my future and only thinking of good memories of my past. *Read this post to find out how we create our list each year. NOTE: Today’s post was inspired by a writing prompt at Studio30 Plus, a social media site for writers 30 and over. The prompt this week: Summer Days. Sounds like this will be a great summer. I’m looking forward to hearing what the Monkey thought of the tomato, haha! I hope he survives the tomato! Ok, I absolutely love that Spanish proverb. My girlfriend just bought a $500 scrapbooking monstrosity that can cut out vinyl lettering. I think I want that proverb in my home office. Great summer ideas. This year is probably going to be my “go through hell” summer, and I am encouraged when I read about someone who has navigated those waters. You not only survived to tell the tale, but you did it splendidly. Isn’t that a great proverb? What a great way to kick off summer…with a quote like that. I hope next summer to put up a hammock in the backyard and spent a great deal of time in it napping or reading. Not sure it will actually happen next summer, but it’s a great idea! Last summer was tough, but I got through it. The great thing about the divorce process is that no matter how bad it gets, you are guaranteed it will be over at some point. Just hang in there. Try eating a tomato and two other foods I have not tried (Monkey). – HA HA!! This is my fav :) LOVE IT! Aunt Jen is welcome to come play with us anytime! Monkey had a big school project on penguins and that boy has more penguin information that I thought was possible. He wants to go to the zoo to see them. Can I “borrow” that proverb? It’s fantastic!!!!! Have a gorgeous summer, filled with all the things that will make u happy! Thanks for the wonderful summer wishes! Of course you can borrow the Spanish proverb. I love it too. Awesome! You guys are going to have a great summer! I love the idea of writing out a “to do” list. It reminds me of the book Dandelion Wine by Ray Bradbury. I think I know what we’ll be doing tonight! I hope you all enjoyed making your own list Tom. Place this list somewhere visible all summer so you can refer to it. We keep it on the kitchen cork board. Do let us know how the homemade mozzarella goes! Great advice Sara! The unexpected activities can turn out to be the most exciting. The water balloon thing sounds fun, but I really, really want to do the 2 new stadiums baseball thing. I’d have to get a real job though. So far this has been an expensive summer, and it’s not even started yet. 2 grand to get my son’s car out of hoc. 3 grand to my daughter’s divorce attorney. Several more to go assist in granddaughter’s recovery from a double lung transplant yesterday. Kind of sucky so far. Monkey just had 4 boys sleepover last night. They had the first water balloon fight of the season. My yard is a mud pit now, but worth it! The baseball games will be fun this summer-I agree. I am sorry to hear you are having some difficulties right now. My thoughts are with you. Hang in there. Fun list! I like the restaurant part- that’s one of my favorite things. I’d also love to do a triathalon, but doubt I’ll have time to fit it in this year. The restaurant idea was mine. Of course the kids don’t care if we try new restaurants! The DC area has so many wonderful restaurants to discover; it should be a lot of fun. Here’s to every summer being better than the last. :) Your list is fantastic too, love that idea. Thank you Melissa. I do hope this summer is better than the last. I am already off to a really good start. First time I saw a real VanGogh, I cried. Thanks Lady Estrogen! Glad you enjoyed it. Now I want to make a list too! Kidlet has been begging for a refreshment stand forever. I think it’s crazy all he wants for summer vacation is work! The list works so well Melissa. When you are having one of those mommy moments where the kids are asking over and over what you are doing and you draw a blank for a good idea, pull out your list! We actually keep our list on our corkboard in the kitchen all summer as a constant reminder. Tomatoes and I will never get along and I’ve come to terms with that. Good luck. Love the list…can’t wait to see how it all comes together. We actually live in the DC area, but my son and I follow a lot of baseball teams. We want to see Lee because we fell in love with him post season last year when he was a Ranger. We will be making a few trips to Philly this summer.